Edinburgh centre Sam Beard is to join Newport Gwent Dragons on a two-year deal at the end of the current season. The 25-year-old's contract with the Scottish club - who he joined in 2013 after leaving Bay of Plenty - expires in the summer. The New Zealand-born former Canterbury B and Crusader Knights player also qualifies for Wales. Beard told the Welsh region's website: "The Dragons have improved immeasurably and are a very happy team." He has played 41 times for Edinburgh, 24 of them starts, and scored two tries but has only made five appearances this season. 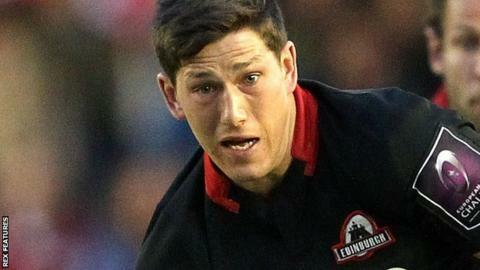 "My time at Edinburgh has been really good," he told Edinburgh's website. "We've been heading in the right direction and it's good to have been a part of it, especially throughout last year's European campaign, and it's been a pleasure to work with the coaches. "Hopefully I can get some decent game-time before the end of the season and finish my time at the club on a high." Beard played in seven of Edinburgh's European Challenge Cup games en route to, and including, last season's final. Dragons director of rugby Lyn Jones said: "Sam has played exceptionally well for Edinburgh and starred against us. "He's a player that gets things right. He is a talented individual and we look forward to him joining the region." Edinburgh head coach Alan Solomons added: "Sam has been a valuable squad member over the past three seasons. "He is a first-class bloke and a good team man. We wish him all the best in his new challenge."